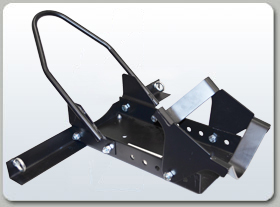 Introducing the B-Dawg® Motorcycle Wheel Chock. The BD-Chock is perfect for securing your motorcycle in an upright position for transportation and storage. This steel motorcycle wheel chock cradles your bike tire to stabilize your bike. Simply push or drive your bike fully into the chock and secure tie-down straps to the attached chock tie-down arms. 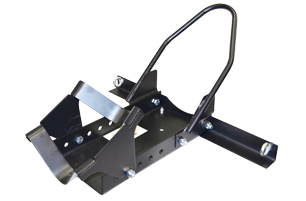 The B-Dawg Wheel Chock accommodates a wide range of tire sizes (up to 20" in diameter for 4" wide tires and up 21" in diameter for 3" wide tires). Just slide the pivoting cradle forward or backward into one of five different positions and secure using the included nuts and bolts. The pivoting tire cradle makes loading and unloading the motorcycle from the wheel chock a breeze.